Gather ingredients. These are common items that would be found in any Vietnamese kitchen! 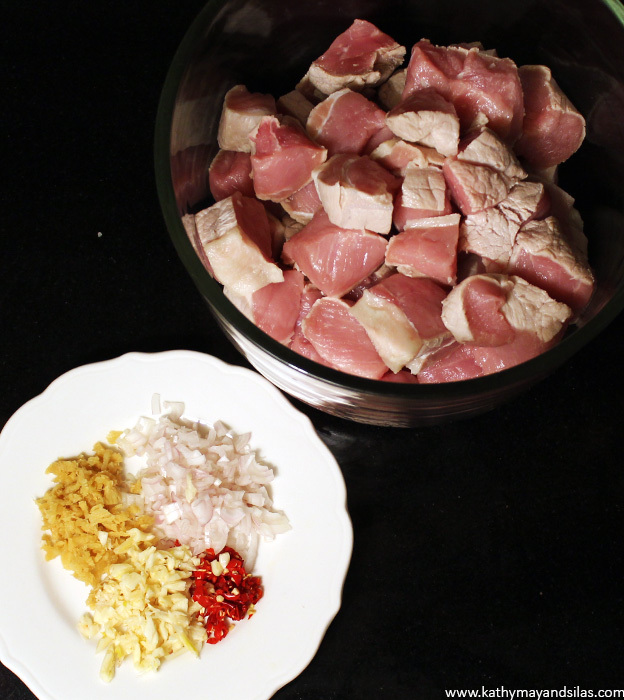 Pork (thịt heo): Virtually any cut is possible. Thịt ba rội (pork belly) is a favorite in Vietnamese cuisine. Sườn (short ribs) are another delicious crowd-pleaser. We have opted for loin for the leanest option. Chili peppers (ớt): We used a combination of cayenne and Thai chili peppers from our very own balcony garden! Pepper (tiêu): We will use black and white peppercorns straight from Vietnam, given to us by Bác Mai. These will be freshly ground in a pepper mill from Ngoại. Sugar (đường): Kathy May’s mom (Mẹ) frequently used either rock sugar or granulated sugar or a combination of the two. We will use the latter which we have quickly on-hand. Fish sauce (nước mắm): Possibly the most quintessential element of Vietnamese cuisine. Dark soy sauce (nước tương): This is not a typical ingredient of thịt kho, but it is a secret weapon that Mẹ used! Dark nước tương is less salty but more colorful than the light version. 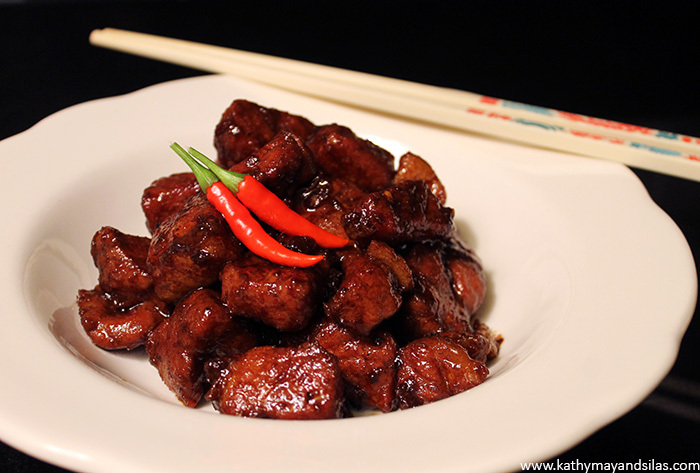 This will help to achieve the perfect aesthetic of our thịt kho. First, clean and cut the meat. Bring a large pot to boil and drop your uncut piece of pork into it for just a minute or two. This cleans the meat, preventing the proteinaceous build-up that can happen during cooking, and also remove any porky smells, just leaving the pure flavor of the meat. Chop the pork into chunks (slices would also be acceptable for similar taste but different aesthetic). Dice ginger, shallots, garlic, and chili in preparation. Marinate the meat. Marinate the pork for at least 30 minutes (the longer the better) with the diced aromatics. Also add salt, pepper (lots of it), sugar, and fish sauce to taste. Remember that thịt kho tiêu tends to be more salty, and it will be served with plenty of rice, so we will be generous. Brown the meat. In a pot large or pan, add a couple tablespoons of cooking oil. Saute garlic until it becomes aromatic. Add the pork and brown the outside. This step helps to seal in the juices; the meat need not be fully cooked. Make the nước màu (caramelization). 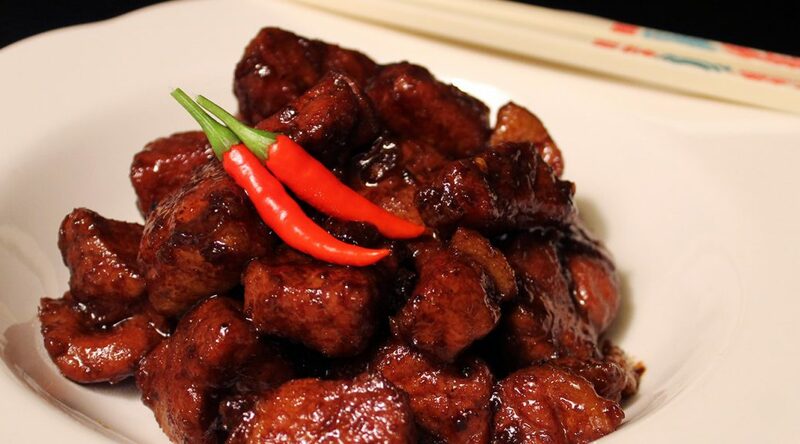 While the pork is browning, we will prepare our caramelized sugar, which is the main step of making thịt kho. Note that many home cooks will recommend caramelizing the sugar first and then adding the meat in it to braise (that’s the way Kathy May’s mom does it). However, we as more novice cooks opt to do caramelize sugar and add it separately, for the reason that sugar on heat can be difficult to control. Furthermore, caramel may be made without water or oil, but the addition of these also make the process easier. We will add a couple tablespoons of cooking oil and a few tablespoons of sugar on a warm – not hot – pan. Turn on the heat and gently melt, stirring the entire time. Do not take our eyes off this sugar! It burns easily and rapidly! Add the caramel to the meat. Once the sugar browns nicely, take it off the heat (still stirring constantly) and it will continue darkening over seconds. If your sugar is burned or overcooked, throw it away and start over! If your sugar is not brown enough, it will be insufficient to color your meat. 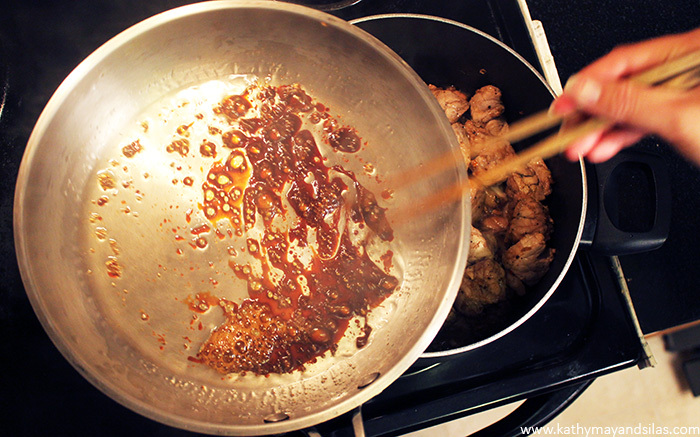 Add the caramel directly to the pot of meat. Braise the meat. Continue cooking the meat, stirring occasionally to distribute the sauce. 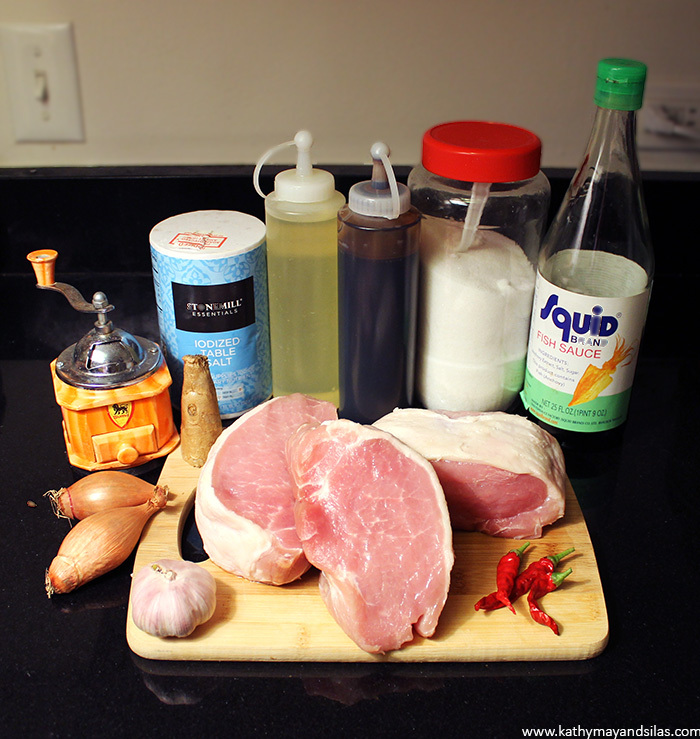 Liquid will come from the pork; there is no need to add more water or coconut juice as in other versions of thịt kho. Achieve a delicious brown color. As the liquid boils away, the pork will become a scrumptious dark reddish brown. 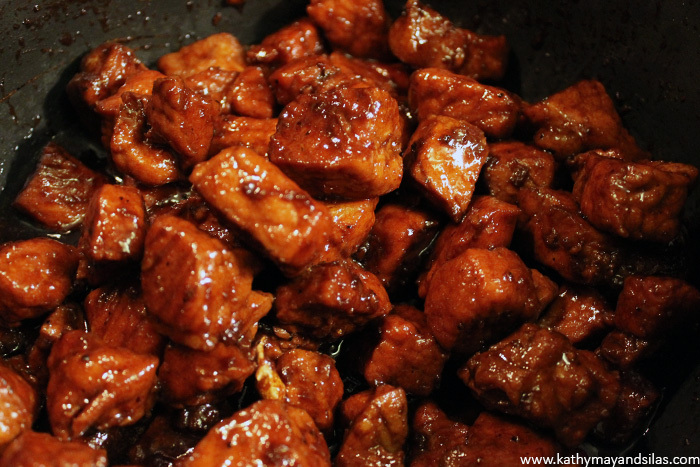 If the color is not brown or deep enough, add a little dark soy sauce (that’s the secret shared by Kathy May’s mom!). Bon appétit. Our thịt kho tiêu has a saltiness that is distinctively Vietnamese from the fish sauce marinade; also sweetness from our labored-upon nước màu (caramelization) that provides a depth of flavor; and finally a pleasant bite from the fresh pepper without being outright spicy! A generous bowl of steaming white rice is an essential accompaniment. We will also enjoy it with a vegetable side. Please share with us your versions of thịt kho tiêu by dropping a note in the Comments section below. Do you have tips and tricks to share? We would love to learn from you and experiment from your recipes! Yum !!!!!! Looks better than the photos posted in the restaurants. I will try your recipe and see how close I can replicate yours.